With the slew of various agencies, big game organizations like the Safari Club and environmental organizations such as the recent addition of the National Wildlife Federation lining up with Letters of Support for the Bureau of Land Management's ill-conceived plan to remove wild horses from the Calico Complex in Northern Nevada for approximately two months during the dead of winter or cattleman Secretary Salazar's plan for the future of the American Mustang & Burro, Western Watershed Projects Biodiversity Director Katie Fite recently shared both her knowledge and views about the "elephant in the room" many of these organizations are failing to address. Using the background and history of BLMs management of the Calico Complex as an example of what's at play behind the scenes, Katie lends her expertise to provide an indepth look at what "on-the-range-management" means to BLM, wildlife, wild horses and the American public. The Safari Club and some Wilderness advocates lose out in BLM grazing decisions and lax management all the time. Perhaps it is easier for them to generate an “enemy” such as wild horses to blindly blame all ecological damage on rather than confront the truth and seek honesty of Ken Salazar’s Interior Department and the BLM in its management of wildlife habitats and public lands. To illustrate what is really happening behind the scenes, I’ll use the Paiute Meadows Allotment as an example of how grass, water and space are taken away from wildlife and wild horses on public lands by BLM and then given to a large cattle ranch for its profits. The Paiute Meadows allotment is 117,096 acres, with 72,433 acres designated as Wilderness. The land area of Paiute Meadows allotment includes all of the Black Rock East wild horse Herd Management Area (HMA), which is the eastern part of the big Calico Complex wild horse round up. It is also where the Calico round up began, in the snow and on private land so BLM could limit public access and scrutiny. The Black Rock Range is a spectacular place. Picture a big rugged irregular very steep-sided plateau cut by canyons. Part of the top, and the east side down to the valley floor is the ”official” Black Rock East HMA. The other side is the Black Rock West HMA, one of the three HMAs in the contiguous Soldier Meadows allotment (Black Rock West, Warm Springs, part of Calico HMA). The Range lies by the northern Black Rock Playa. From its top, in Wilderness, tremendous views of the Jackson Mountain skyline unfold - as Gary Snyder writes in Mountains and Rivers without End, “the tooth of a far peak called King Lear”. There is no fence on the top of mountain range to separate the two grazing allotments that border one another here, Paiute Meadows and Soldier Meadows. The BLM artificially drew the wild horse HMA lines on the boundary between two cattle empires. The boundary has very little to do with wild horses – and everything to do with cows. There is only an artificial line on the maps in the Winnemucca BLM office that actually separates the wild horses areas and animals move freely back and forth. This serves as an example of how BLM contrives to artificially chop up landscapes to maximize cattle numbers at the expense of all other values. Once BLM draws an imaginary horse area separation line, then they can try to incrementally sneak in fencing over time - on the basis of their fabrication of separation between two HMAs. The BLM range folks have long lusted to build a fence on top of the mountain range between the cattle allotments. A fence on top of the range would be a disaster not only for horses, but for sage-grouse and big game too. I see sage-grouse nearly every time I go hiking in this Wilderness. Fences are a big problem for sage-grouse as they collide with fences and die. This area is critical for sage-grouse nesting and brood rearing. The only reason BLM hadn’t built a fence already is the horses, as there has been pushback from their own wild horse specialists. However, if more pliant wild horse specialists get put in place, which could well happen after this Calico Complex debacle, one has to fear the worst. Cattle trespass has long been rampant on the top of the Black Rock Range in Colman Creek and other headwater areas. Ranchers have not controlled their cattle as they are required to do, and Winnemucca BLM has allowed this to continue year after year. I have complained often in the past but Winnemucca BLM has given me the impression that the public pointing out cattle trespass is at times more of a problem than the trespass itself. I hiked into this Wilderness area again in September 2009, and recent cow manure was everywhere; across the top and higher elevations in both Paiute Meadows and Soldier Meadows. There was no scheduled cattle grazing in that area of Soldier Meadows in 2009, as it was theoretically being “rested” from cattle but I witnessed springs, seeps and long lengths of Colman Creek headwaters that were chock full of fresh cattle manure. This uncontrolled and routine trespass BLM allows to occur here year after year, including in areas that are being “rested”, directly takes grass out of the mouths of wildlife and wild horses. Who knows how many “AUMs” get consumed annually out here by unauthorized cattle grazing? In 1995, BLM authorized a livestock grazing, wildlife and wild horse “Final Multiple Use Decision (FMUD) for Paiute Meadows that set the basic wild horse numbers (AML) that remain to this day. BLM has refused to use new info to update the AML. BLM calculated what it calls a carrying capacity based largely on “forage”, but the carrying capacity for this whole area that was calculated back then was recognized as flawed. Everyone from the Nevada Department of Wildlife (NDOW) to Wild Horse Groups to the Sierra Club complained - but BLM just did what they wanted. The BLM Winnemucca Field Office has long known that the carrying capacity for Paiute Meadows and Soldier Meadows is invalid. But BLM and/or ranchers seem to really like it because it lets them keep the cow numbers higher, bumps up the re-sale price of ranches, allows ranchers to get loans from banks based on a higher number of cattle and get more tax dollars as subsidies. Ranchers can get loans on public lands by using cattle AUMs as collateral, as well as Annual Operating Loans. They can also get “disaster” payments from tax dollars for drought based on head of cattle. When reading these BLM Decisions, the Active or Authorized AUMs are what to focus on, as the Suspended AUMs are pie-in-the-sky “paper cows” and are often based on rancher claims with numbers drawn out of thin air in the distant past from adjudication processes that had no basis in reality. Ranchers today appear to use them largely to snooker hobby ranch buyers into paying more for a ranch with a public lands grazing permit than the permit is actually worth. To add fuel to the fire, BLM refuses to remove these AUMs from the books and thereby creates a constant tension with ranchers as they are always wanting to get “their” paper cows back as real cows out on the land. Flawed 1994-1995 Decisions and methods used to determine carrying capacity in both Paiute Meadows and Soldier Meadows Allotments set the stage for carrying capacity conflicts right up to the present 2009 Calico Complex Round Up. Beginning in 2001, BLM started conducting a combined Soldier Meadows and Paiute Meadows Grazing Evaluation process. New decisions came down at slightly different times. Paiute Meadows came out first. The Soldier Meadows rancher at the time wanted quite an audacious and controversial cow proposal, which he ultimately got with Bob Abbey as Nevada State Director. Then later, in 2008, BLM issued yet another Decision where the current Soldier Meadows operation got an even sweeter deal. To return to Paiute Meadows, in 2003, BLM then issued an updated grazing document called a “FMUD” Final Multiple Use Decision because it included cattle, wildlife and horses. There has not been a new grazing decision for the Paiute Meadows Allotment since 2003. Here’s what the Paiute Meadows FMUD did: It carried forward the old 1994-95 Black Rock Range East Wild Horse AML number. BLM stated “we are re-affirming our previous management action ... that established the AML for the Black Rock Range East HMA at 93 head [of horses]”. The horse numbers were set between a range of 56 horses (low) and 93 horses (high). The amount of AUMs (Animal Unit Months) BLM states is appropriate for wild horse use was set between 672 AUMs for all year (for the 53 horses), and 1,116 AUMs for all year (for the cap of 93 horses). So 93 wild horses is the maximum population BLM paperwork allows. During the 2003 Paiute Meadows evaluation process, Winnemucca BLM stated: ”Based on monitoring data collected during the re-evaluation period, there have not been any significant problems associated with the wild horse use of the range”!!! Now, based on other BLM documents that show wild horse populations during this time period (1994-2003), it is clear that horses were rarely, if ever at AML; they were always above AML! So what Winnemucca BLM really said here is, while wild horses were actually greatly over AML the whole time, they were not causing significant problems to the range! In fact, when it issued its 1994 Decision in Soldier Meadows paralleling the Paiute Meadows process where it referred to the “Black Rock Range” horses, BLM stated: “Once AML is reached – which should take two gather cycles - in about six years, wild horse and burro population will be maintained within the following ranges in order to ensure that the carrying capacity is not exceeded. These ranges are based on gathering horses every three years. If gathering schedules change, these ranges may change". The 2003 Paiute Meadows Decision also carried forward the old 1994-95 wildlife allocations. These were established as a combined total of 2,325 AUMs for mule deer, pronghorn antelope, and bighorn sheep. This too was derived from the flawed BLM 1994-95 carrying capacity computations. In 2003, BLM stated that the wildlife weren’t causing any problems, so the wildlife got the same theoretical amount of forage as in 1995. The only wildlife that gets anything allocated to it by BLM has antlers. While BLM rubber stamped the same forage allocations for wild horses and wildlife in the 2003 Paiute Meadows FMUD, what was NOT the same was the cattle AUMs; those were increased from 3550 active AUMs to 4298 Active AUMs. BLM approved of the increase in cattle AUMs to allow for an additional “300 head within the South Paiute low elevation area in spring and winter”. Astute readers of the 2003 Paiute Meadows Decision will find a math error in the text, where BLM appears to have been trying to minimize public perception of how much the cow increase really was. And a confusing chart that shows not all the added cattle AUMs in this new Decision were actually where BLM claimed they were. But since this whole forage and numbers game is largely flimflam anyway – EXCEPT when BLM wants to round up horses – what’s a few percentage points, or why bother actually keeping the cow increase all in the area where you claim it is? The 2003 Paiute Meadows Decision also revealed that BLM had already been sneaking those 300 head of cattle in on a year-to-year basis by issuing something called a “TNR” permit (Temporary Non-Renewable grazing permit). BLM had been annually issuing these extra “temporary“ permits for 300 head of cows for several months in the winter in this low elevation area since 1998! Never mind how that conflicted with the “allocation” for wildlife or wild horses. Then BLM justified this permanent increase in cattle AUMs by saying this area is outside their own artificially created wild horse HMA boundaries. Even if those 300 head of cattle are grazing outside the wild horse HMA boundary, which is in the east and south here, they are still in a spot where they will conflict with wildlife. Thier extra cattle are reducing the available forage, water and space wildlife need, and if the ranchers check on the cows, they also add to further disturbances of wildlife in the area especially in winter. But BLM sure doesn’t seem to care much any more about disturbing wintering wildlife as is evident by the Calico Complex round up being conducted in the dead of winter. It was Bob Abbey, then Nevada BLM Director who was overseeing the Winnemucca Field Office when this 2003 FMUD took grass, food, water, cover and space away from wildlife in the winter and gave it to the cattle industry. Abbey was very aware of what was transpiring in both Paiute Meadows and Soldier Meadows , which had long been areas of controversy. Bob Abbey is now serving as Director of the BLM under Interior Secretary and rancher Ken Salazar. Abbey and the current Winnemucca BLM Manager, Gene Seidlitz, were both involved in the Paiute Meadows and Soldier Meadows processes. I participated in a Range Tour with Director Abbey and the ranchers in both allotments at the time in 2003. However, wildlife wasn’t the only loser in this deal as BLM also took forage away from the wild horses too and justified this by other artificial lines they drew on the east side of the HMA, mapping the area part way up the slope of the range. As a final note, during the prolonged 2003 and 2004 Paiute Meadows and Soldier Meadows allotment processes, Nevada Department of Wildlife as well as U.S. Fish and Wildlife Service are on record as telling Winnemucca BLM that information that was essential to base ANY new decision on was lacking. Yet BLM ignored USFWS and NDOW and took forage, water and space away from wildlife and gave it to a big rancher instead. So in the early winter of 2009, BLM issues the Calico Wild Horse EA with its justifications for the dead of winter round up. Suddenly, all wildlife scientific literature to the contrary, BLM finds its just fine to disturb wildlife, including sage-grouse, over two solid months on their winter range on over a million acres of public lands. BLM continues to claim drought as an issue, despite this region having experienced an extraordinarily moist spring and summer, and lush grass growth in 2009. They also make much ado about how winter range is so limited, horses must be rounded up right now. 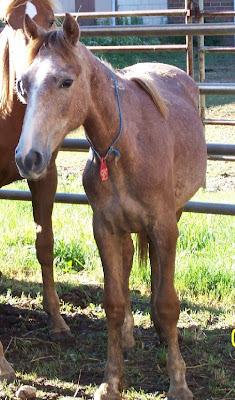 BLM also claims they have been suddenly struck by a lightning bolt of new information regarding wild horses moving all over the place and uses this as justification to cast its horse capture net very wide over many HMAs, including into areas outside their artificial boundaries as well as into the very area that BLM claimed in 2003 “was outside the HMA”. But there are documents in BLMs files that show they have known this whole area was a complex, and horses were moving outside their artificial lines - all along! The wider the net is cast, the more horses can be cleared out of the way for projects such as the upcoming Ruby pipeline that is barreling down on the north of this area. As BLM spreads as broad a net as possible across the region to capture and remove horses including those outside the hokey HMA boundaries and specific allotment boundaries, they kept making noise about how wild horses outnumber cows in the area. Yet, it appears BLM has not factored in the cows that graze in the allotments surrounding the Calico Complex where they extended their capture net, which includes areas they have known wild horses have been present in all along. If one were to compare BLMs capture area maps from the Calico Complex EA against maps from the 2003 Paiute Meadows EA, it can be seen that BLM cast its capture net into the very site where BLM justified increasing cow numbers in winter in 2003 because it was “outside” the hokey HMA lines. When BLM was authorizing increases for cow numbers in Paiute Meadows in 2003, BLM said the area was outside the HMA, so increasing cows made no difference to wild horses. But the truth is, those wild horses from the South Paiute Meadows low elevation area very, very likely did rely on that same winter range that BLM authorized increased grazing on in 2003 merely for the financial benefit of the large rancher. Through the Calico EA, BLM has then gone on to make claims about the great lack of winter habitat for wild horses, wildlife and everything else in the area. But by BLM allowing dead of winter grazing at this lower elevation during critical winter months, it has increased the stresses on all animals in the neighborhood and ecosystems. So this leads to the question, why is Ken Salazar’s Interior continuing to mislead the public about wild horses, the relative impacts of cattle and horses and continued harmful cattle actions in the Calico Complex? This only serves to fuel controversy and destroy any efforts at “balance” on the public lands. If environmental groups and organizations like the Safari Club want to jump into the middle of something, perhaps they should consider stopping the high jacking of public resources (food, water, and space) for private cattle ranchers and corporate profits as grazing on public lands adversely affects public lands and wildlife habitat that belong to all Americans, not just a few. The BLM has again announced their intent to remove more wild horses from public lands in the Ely District’s Eagle Herd Management Area in Nevada. As usual, the proposal is filled with the worn out rhetoric of “save the horses” and “protect the range” and a whole lot of spin but little mention of BLMs previous chicanery. “The Wilson Creek HMA (approximately 687,932 acres of public and private land) and the Deer Lodge Canyon HMA (approximately 109,717 acres of public and private land) were combined in the 2008 Ely District Record of Decision and Approved Resource Management Plan into the Eagle HMA (approximately 670,000 acres of public land)". According to real world math vs. BLM math, the Wilson Creek and Deer Lodge Canyon acreage totaled 797,649 acres before BLM created the “new” Eagle HMA in 2008, not 670,000 acres. With a loss of approximately 127,649 acres in its creation (and we can only speculate how many critical water sources disappeared in this decision), how is it that BLM can tell the public with a straight face that the Eagle HMA is “nearly identical in size and shape to the original Herd Areas representing where wild horses were located in 1971”? If you would like to check on the validity of the historical Herd Area acreage vs. the new Herd Management Area acres by cross referencing them with the National Program Office Fiscal Year 2009 Herd Management Statistics for Nevada, you will be in for a real treat as, apparently those Herd Area acres identified in 1971 have now been erased from the records. Perhaps BLM intends to imply and allow the public to assume this 127,649 acres now lost from historical Herd Area records are a result of their removing the “private lands” when they created the Eagle HMA. Without BLM providing any numbers in the current EA of what comprised that acreage, it’s is kind of hard to tell how much was private, so let me help BLM out. In the National Program Office Herd Management Area Statistics for Fiscal Year 2008 for Nevada (before BLM made the acreage breakdowns disappear), approximately 670,786 acres were listed as BLM public lands for the Wilson Creek HMA and approximately 106,735 acres were listed BLM public lands for the Deer Lodge Canyon HMA; all combined, the most private acreage could possibly account for is only 20,128 acres. As for the other 107,521 acres that disappeared in the 2008 Resource Management Plan, can anyone guess what happened? Well, quite simply put, it has been stolen from the wild horses and the public through a bureaucratic Schell game. So how about BLMs wild horse population figures; could there be more of BLM’s math at play here as well? You betcha! 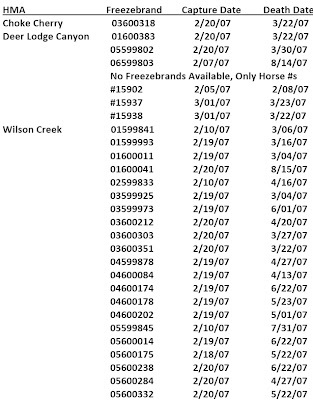 The Wilson Creek and Deer Lodge Canyon wild horses were last rounded up in February 2007. In the 2007 Preliminary EA, BLM stated they estimated populations totaled approximately 900 wild horses. According to the BLMs 2007 National Gather Schedule report, BLM removed 646 wild horses from Wilson Creek and 106 wild horses from Deer Lodge Canyon for a total of 752. The estimated remaining population was 130 wild horses for Wilson Creek and 30 wild horses for Deer Lodge Canyon, which totals 160 wild horses. If you add those removed from those remaining, it equals 912 animals; right on target with what BLM claimed they needed to remove in order to "protect the range from deterioration associated with an overpopulation of wild horses". Yet, lo and behold, just one year later, BLMs National Herd Statistics report a bit of an anomaly with these former figures. Apparently, Wilson Creek jumped from 130 wild horses to 386 after only one foaling season (despite a reported intermingling of these two HMAs, Deer Lodge Canyon saw no similar population explosion as BLM reported only 35 for the area). In the current EA on page 4, BLM is now claiming that, “The area was last gathered in the winter of 2007. Due to weather conditions at the time, the BLM did not gather enough excess wild horses to achieve AML” even though their previous EA and reported removals clearly show that BLM did achieve AML at that time with no interference from the weather. BLM goes on to say that an aerial census conducted in March of 2008 found 421 adult horses (so where did the National Program Office get the 386 figure from?) and an aerial census conducted last month (December 2009) directly counted 595 wild horses within the Eagle HMA alone. As for the 2007 round up reportedly achieving their former population goals, that’s yesterday’s news as now BLM reports that over the last two years, they have found heavy resource damage occurring as a result of the remaining wild horses whose most recent estimates top 645 animals spread out over a minimum of 670,000 acres (BLM estimates an additional 50 horses are permanently residing “between” the Eagle and Silver King HMAs that are causing a potential traffic hazard along hwy 93 but fails to report how much acreage between BLMs imaginary HMA boundaries this actually covers). While the current proposal also throws in the removal of wild horses from the Utah managed Mt. Elinor and Chokecherry HMA, much less information is presented to the public about the multiple use "relationship" for Utah. For example, while BLM states that livestock grazing has been at or below permitted use levels in the Eagle HMA (pg. 22), they fail to include the livestock allotments within the Utah HMAs. As a side note, BLM performed another bureaucratic shuffle to report livestock use by reporting a 10-year average versus current use. I suspect this is because they really didn’t want to report what the livestock have been consuming since the last round up in 2007.
at BLM holding facility in Wisconsin, 7/18/07. And so, to protect the range, livestock permittees and wildlife from all that heavy resource damage being caused from wild horses since the 2007 round up as well as preventing wild horses from “starving to death”, BLM must again send the choppers to scoop up a questionable wild horse population to save them from potential death on the range. To BLM, it matters little if they run wild horses and mares heavy with foal during the dead of winter in an area they report as ranging in temperatures from "greater than 90 degrees Fahrenheit in the summer months to minus 20 degrees in the winter”. While BLM is going to capture the Eagle wild horses in order to protect them from the harsh realities of an overpopulated range, here’s some additional concerns about the harsh realities they are about to face that BLM obviously isn’t going to report to the public in the current capture proposal. 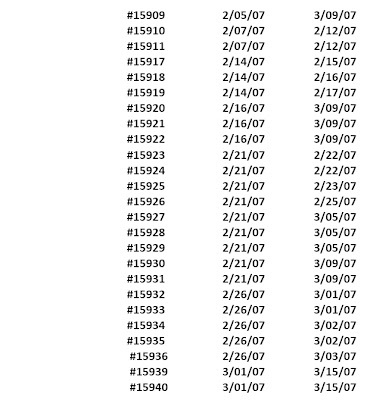 The following information was obtained from BLM Capture Status Records obtained from American Horse Defense Fund's Freedom of Information Act request that provided the status of captured wild horses from January 1 through October 17, 2007, as well as BLMs 2007 National Post-Gather Schedule. The first concern is, according to BLMs 2007 National Post-Gather Schedule, they removed 802 wild horses from the Wilson Creek Complex in 2007 but researching the Capture Status records, only 766 wild horses could be found. 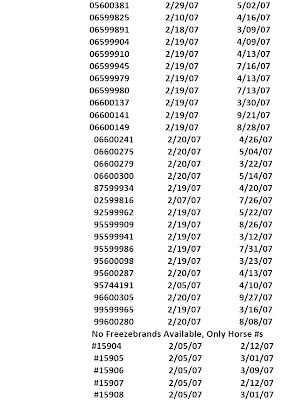 *Why were zero horses found in the Capture Status records for Utah’s Mt. Elinor HMA when BLM reported they removed 25? 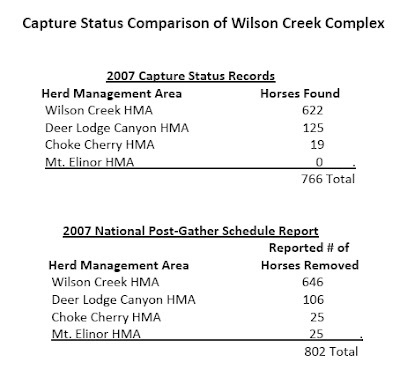 *Why were more horses found in the Capture Status reports attributed to the Deer Lodge Canyon HMA than BLM reported removing in their 2007 National Gather Schedule? *Where did 36 wild horses disappear to between the round up and their shipment to BLM holding facilities? *Or did BLM publicly report more wild horses were removed from the range than they actually took to inflate holding facility numbers? There’s one other serious concern that BLM probably isn’t going to bother telling the public about either regarding the truth of what happened to the wild horses in the Wilson Creek Complex after they were driven by helicopters and captured in the winter of 2007. BLMs Post-Gather Report reported a death toll of 3 wild horses dying and 11 that were destroyed during the Wilson Creek Complex round up. It is these Post-Gather Reports that BLM derives their "low" capture mortality statistics from. 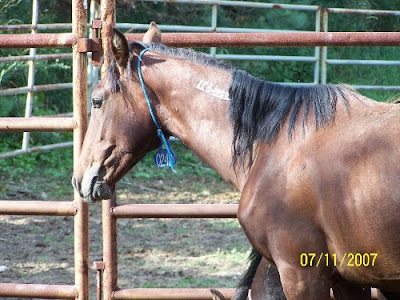 But the 2007 Capture Status records revealed a much grislier scene played out in the following months in BLM holding facilities as a total of 85 wild horses were found dead throughout the nine-month report, many of which died within a month of capture. Since American Horse Defense Fund was embroiled in a legal fight for months to obtain the status of wild horses and burros for just these paltry nine months in 2007, good luck to us in finding out how many wild horses will eventually die in BLMs holding facilities after this newest removal operation. the new capture plans for the Eagle wild horses.